D-Wave Systems has attracted a lot of criticism from computer scientists over claims it has developed a way to create a marketable quantum computer. But whether its technology will ever be viable outside of a laboratory setting or not, investors seem to be eating it up. The company announced this week that it received $17m in a third round of venture capital funding. International Investment and Underwriting (IIU) of Dublin led the round with added support from existing investors. Vancouver-based D-Wave had already raised more than $40 million in venture funding. To date, quantum computers have been relegated to mere scientific curiosity. They are massive, complicated, expensive and unproven machines that few computer scientists want to tackle. In addition, in order to obtain the quantum effects, the machines must maintain near-complete isolation from the outside world. In short, nothing you could stick in a 1U slot. According to the laws of quantum mechanics, objects at an atomic level can simultaneously occupy two or more places or states at the same time. And despite lacking a total understanding of this strange phenomena, it's utilized as the basis of quantum computing. A traditional computer represents information as binary bits: either 1 or 0. In a quantum computer, each bit of information — called a qubit — can hold the 1 and 0 state simultaneously. This means one qubit can represent 00, 11, 01 and 10. It's a small advantage made theoretically astounding when applied exponentially. Two qubits can represent 16 values, four qubits can represent 256, six qubits can represent 4096, and so on. Problems that would have taken years to solve on a traditional computer could theoretically take seconds on a quantum box. [Update: A number a you have taken exception to the description of quantum computers provided in this article. We've amended the story to note the exponential as opposed to linear growth of values that can be achieved through qubits. An embarrassing mistake. In addition, we were perhaps a bit brief in describing the principles behind and advantages of quantum computing. 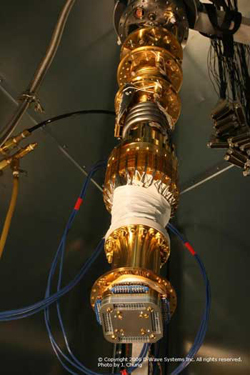 D-Wave's own machine, Orion, has yet to progress beyond 28 qubits. But the company has said it will be able to fab a chip housing up to 1,024 qubits by the end of 2008. In addition, the company claims it's found a way to make a quantum chip design based on standard semiconductor manufacturing techniques. The D-Wave chip is made from aluminum and niobium, elements that when made sufficiently cold (near absolute zero) form a superconductor. Electrons in the superconductor bind together into particles called "Cooper pairs", which can occupy the same quantum state. An electrical current is run through, and by calculating the pattern and timing the magnetic fields created, quantum calculations are possible. D-Wave first publicly demonstrated the Orion last February at the Computer History Museum in Mountain View, California, and in November at a supercomputing conference in Reno. The company's disposition for hype in addition to lofty promises about the immediate viability of quantum computing have earned D-Wave a fair share of critics. They argue D-Wave hasn't shown any evidence its design will be able to scale to the magnitude they are promising. A taster of that skepticism can be found here, at the Quantum Pontiff blog.